When talking about pet health, such as a dog, not eating can be a worrisome thing for its master. When a pet suddenly changes their eating habits in such a dramatic manner, a trip to the veterinarian is the best bet to determine the cause. Dogs are wonderful creatures, but they do need to be cared for. Feeding, watering, grooming and a big dose of continuous love are the investments required of a dog owner in order to have a happy, healthy pet. From time to time, however, things happen to disrupt the normal balance in a dog’s life. It may a health issue, or it may be a psychological issue; the effects it has on the dog though can be quite serious if left untreated. Dogs, like humans, occasionally experience a minor disturbance in their physiological makeup. It may be caused by excessive heat, overexertion or cold. It may be age; deterioration of teeth or a change in body functions. When it does happen, the dog may simply stop eating. When it continues for more than a day, a closer look at the cause will be needed. A visit to the veterinarian is crucial to help determine the problem. The problem could be as elementary as an upset stomach from eating something gone bad, or could be related to a more serious issue such as poisoning or parasites. Even more serious are health threats like heart disease, cancer and thyroid disorders. Only a qualified professional is knowledgeable enough to evaluate the symptoms, conduct tests to rule out diseases and make a proper diagnosis of the dog’s condition. For a dog, not eating is like not breathing air. Problems such as dental issues are easily remedied. Changing the diet of only the dog not eating properly will often solve the issue; a sore mouth is more amenable to a soft, moist food than one that is crunchy and hard. Any other dogs in the home should be encouraged to remain on their traditional diet to avoid any undesired changes in their bodily functions. Many people do not realize that dogs are extremely sensitive to their surroundings. Canines appreciate a structured, ritualistic routine that remains constant day after day, and look forward to certain triggers: their master returning home, dinner time, their familiar and comfortable bed as well as their surroundings. Any changes to the dog’s normal day to day schedule can create anxiety, which could very well manifest in its eating habits. Separation anxiety is a common issue when the dog’s master and family leave the home for an extended period, such as vacation or a business trip. Suddenly, the routine is disrupted; no familiar greeting when a family member walks in the door; no playful interchanges to which the dog is so accustomed. Now someone new visits each day to feed and walk the pet. Even more traumatic can be a boarding situation, where the dog is removed from its familiar surroundings and placed in a new location with strange smells and people. 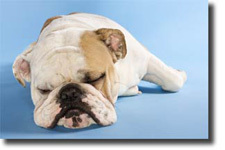 These situations can also cause the dog to become depressed. Anxiety and depression create many physiological upsets in a dog; not eating is likely the most prominent. Masters who are cognizant of their pet’s normal habits will be alerted immediately to any changes in their eating habits. It is important to have the dog’s health evaluated as quickly as possible should the condition continue for more than a day or two. Keeping on top of the dog’s health will ensure that the pet will remain a happy and healthy one.